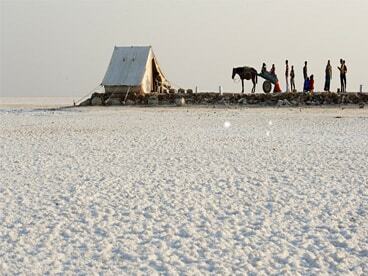 The Rann of Kutch is a salt marshy land in the Thar Desert in the Kutch district of western Gujarat. 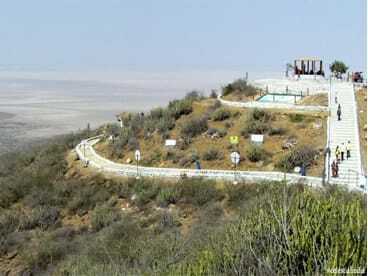 It lies between Gujarat in India and the Sindh province in Pakistan. It comprises of around 30,000 sq. km of land which includes. The inhabitants of Kutch are called Kutchhi and have a language of their own with the same name. The Great Rann of Kutch, The Little Rann of Kutch and Banni grassland.The Rann of Kutch is famous for its white salty desert sand and is reputed to be the largest salt desert in the world. The Rann of Kutch is arguably the best backpacking destination in the state of Gujarat, which is endless miles of salty and marshy land in the Thar Desert. The white desert is located between Gujarat in India and the Sindh province in Pakistan and comprises of around 30,000 sq. km of land which includes the Great Rann of Kutch, The Little Rann of Kutch and Banni grassland. 25 kms north of Khavda, the top of the Black Hills is the highest point in Kutch, at 462 m. From here, the entire northern horizon vanishes into the Great Rann, the desert and sky often becoming indistinguishable. It is one of the few non-coastal locations where you feel like you are at the edge of the earth, on the brink of incomprehensible vastness that fades off towards infinity. Looking out from the Black Hills, you can understand the tremendous effort that those who undertake the crossing of the Great Rann have to make. Since this is one of the places where a civilian can get closest to the Pakistan border, there is an Army post at the top; beyond here, only military personnel are allowed. The hill is also the site of a 400-year-old temple to Dattatreya, the three-headed incarnation of Lord Brahma, Lord Vishnu and Lord Shiva in the same body. Bhuj connects you to a range of civilizations and important events in South Asian history through prehistoric archaeological finds, remnants of the Indus Valley Civilization (Harappans), places associated with the Mahabharata and Alexander the Great's march into India and tombs, palaces and other buildings from the rule of the Naga chiefs, the Jadeja Rajputs, the Gujarat Sultans and the British Raj. Over the 4000-year inhabitation of Kutch it developed trading and migratory relationships with ancient civilizations as far abroad as Zanzibar, the Middle East and Greece, fostering a unique ethnic mix of peoples and traditions in the region. In the 21st century, most people travel by land in fast-moving buses or trains, and to reach destinations further away, many even travel in airplanes. Sometimes it is hard to remember that until the mid-1800s, overland travel was done by horse or bullock-cart. That human technological flight began only a century ago, and flying only became available to average travellers in the last 50 years. Until the middle of the 20th century, for the several millennia of human history that came before us, people voyaged on the seas. How many of us today have traveled on the open ocean? Dholavira is the larger of the two most remarkable excavations of the Indus Valley Civilization or Harappan culture, dating back to 4500 years ago. 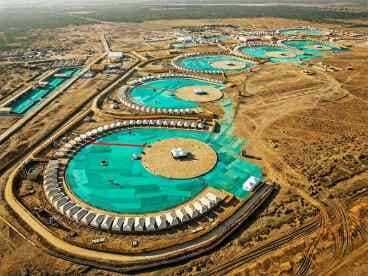 While the other site, Lothal, is more exhaustively educated and easier to reach, a visit to Lothal only complements, rather than replaces, a visit to Dholavira. 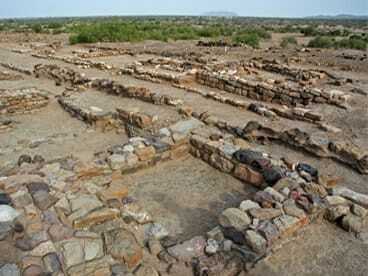 What this site offers you, in the intense environment that comes with being surrounded by the Great Rann of Kutch, is a unique insight into the pioneering Harappan mind, with one of the world’s earliest and best planned water conservation systems and what might be the world’s first signboards, written in ancient Indus script. 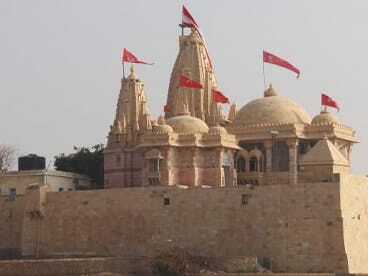 Ashapura Mata Temple, a 14th-century temple, is dedicated to the chief deity of Jadeja Rajputs, Ashapura Mata. 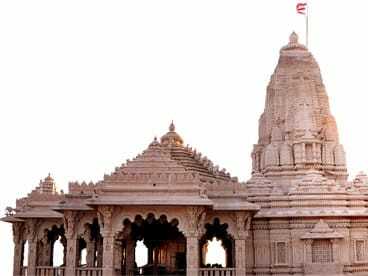 The temple was commissioned under the rule of Jadeja dynasty and was constructed by two Karad Vanias- Ajo and Anagor. Ashapura Devi Maa, an incarnation of Annapoorna devi, is popular amongst her devotees as she fulfills desires and wishes of people who pray to her in need. In Gujarat, many other communities worship her as a kuldevi. Origin of the shrine is stepped in antiquity. 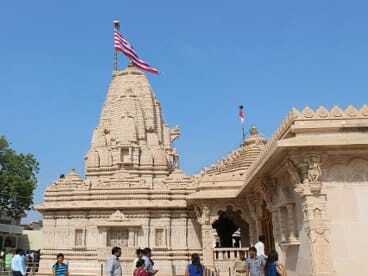 One can see the references of Ashapura Devi Maa in the Puranas, Rudrayamal Tantra and so on which are all said to point to this shrine in Kutch. 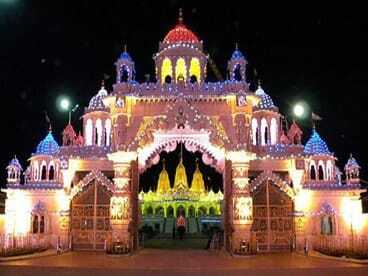 In a land replete with pilgrimage sites, Narayan Sarovar is a different kind of holy experience. At almost the westernmost point of land in India, it can only be reached by traveling over 100 km from Bhuj across the barren scrubland of Kutch. A journey after which the appearance of a vast lake will surprise you even though you have come to see it and its spiritual significance will be tangible. Narayan Sarovar Lake is one of the 5 holy lakes of Hinduism, along with Mansarovar in Tibet, Pampa in Karnataka, Bhuvaneshwar in Orissa and Pushkar in Rajasthan. The lake is associated with a time of drought in the Puranic area, when Narayan (a form of Lord Vishnu) appeared in response to the fervent prayers of sages and touched the land with his toe, creating the lake, now revered as holy to bathe in (though this is not recommended). The earliest mention of the place can be found in writings of Chinese traveler Hiuen-Tsiang. Hiuen-Tsiang mentioned it as “Kie-tsi-shi-fa-lo situated on the western border of the country close to the river Indus and to the great ocean" of Kutch. According to Hieu-en-Tsiang, Koteshwar port was five miles in boundary near the mouth of the river Indus. There were 80 monasteries with about 5000 monks in them chiefly from the school of Sammityas. In the middle of the completion were thirteen temples of which Mahesh Mandir was full of good monument and where ash-smeared heretics lived. Except some temples, Koteshwar shows few signs of its former greatness. At the far northwest corner of Kutch, facing north across the Great Rann towards Pakistan, stands Lakhpat, once an important port city but now virtually abandoned for almost 200 years. A place where you can imagine the rise and decline of a great port city, and simultaneously contemplate the vast emptiness of the desert and the sea. When the 1819 earthquake sent the Indus River on its present course to the west and the Great Rann dried up, so did Lakhpat. It was left a humble town around the ruins of its former grandness, now only with Kori Creek that still flows into the Rann . Though it requires a long journey to reach Lakhpat, the intrepid traveler will be rewarded. 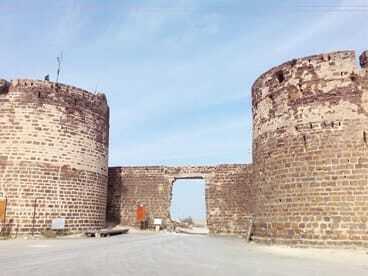 The 7 km fort walls, erected in 1801 by Jamadar Fateh Muhammed, are still nearly intact, and offer tremendous views out over the Rann. Due to the extremely clear desert air and remote location, the night sky is spectacular (visit near the new moon for best stargazing) and sunrise or sunset in a landscape of such endless horizons are not to be missed. © Rann Resort Dholavira. All rights reserved.